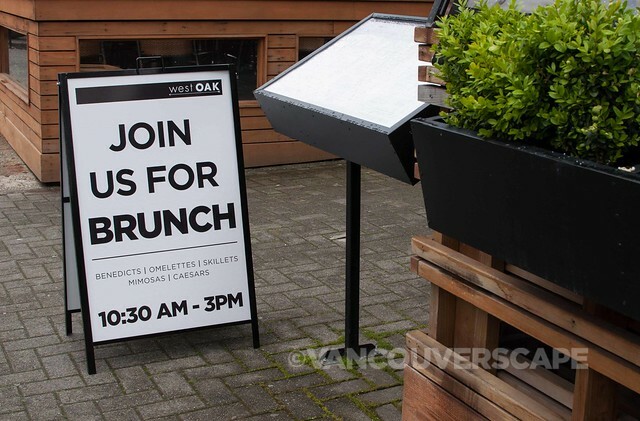 With patio season getting underway, it was time to savour a spring brunch al fresco, and what better way than to dine at one of Yaletown’s numerous people-watching-worthy spots: West Oak Restaurant. 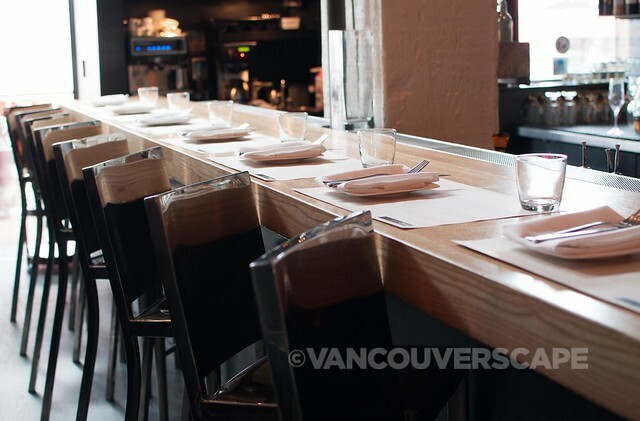 Formerly Chinois, this prime Yaletown restaurant offers lunch, dinner, late night dining, and most recently, a full brunch menu. Executive Chef Tim Cuff designed a menu filled with brunch classics as well as appetizers, salads, and gourmet sandwiches. 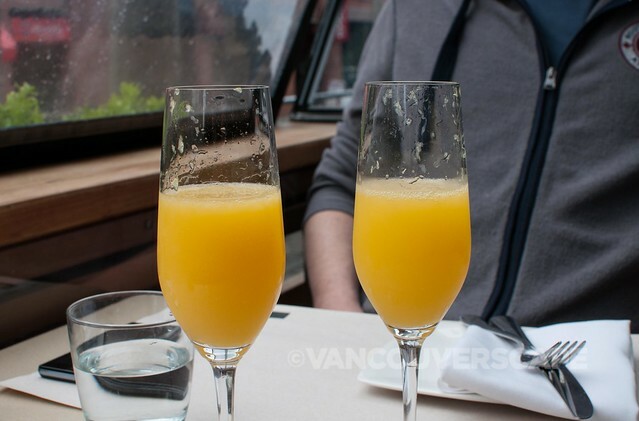 We started our morning with Mimosas made with freshly-squeezed orange juice. Cocktails (doubles) are $9 each and include the Good Thyme, Cadillac Margarita, Moscow Mule, Aperol Spritz, and West Oak Caesar (made with house pickled beans). 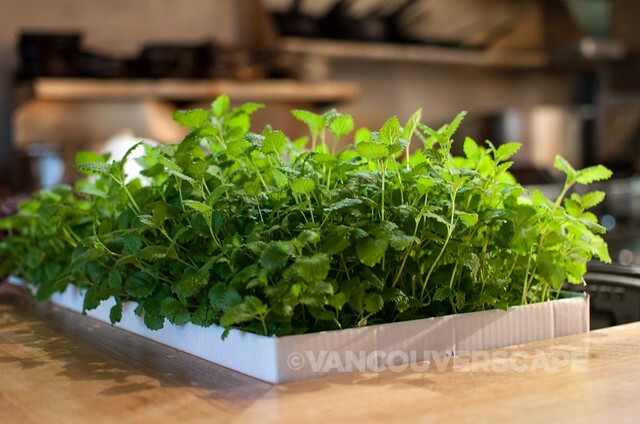 Cuff uses fresh herbs right from the counter, free-range eggs and chicken, Oceanwise-sanctioned seafood, and grass-fed meat from local suppliers such as Two Rivers Meats. 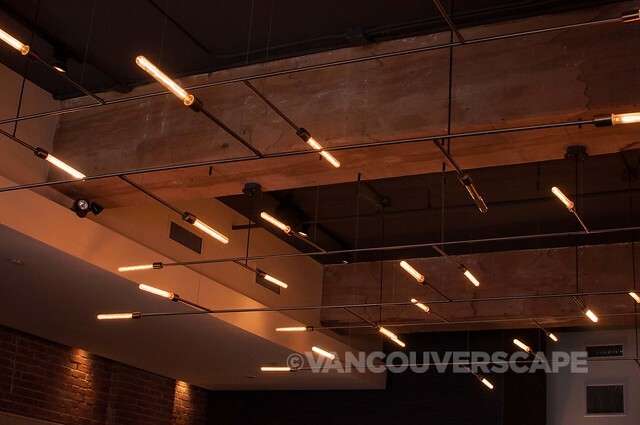 The restaurant’s modern brick-walled interior contains a lot of wood with a simple, effective glass tube-and-aluminum lighting system. The side bar’s wooden counter seats a dozen comfortably, right near the heated outdoor patio that can accommodate about 26 diners. Out on the patio, a flat screen TV is mounted unobtrusively in the corner. There are blankets to cozy up in on those less-than-stellar days. Casual rock and 80’s tunes were piped over the loudspeakers on the morning of our visit and we noticed a mostly young clientele; service was efficient and friendly. 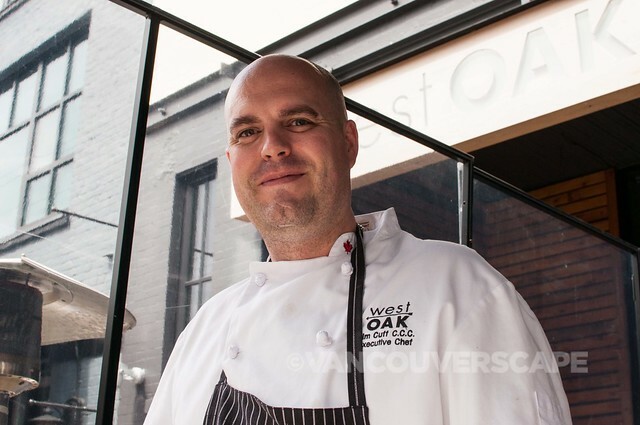 Chef Cuff’s impressive culinary resume includes Nita Lake Lodge, West, Wickaninnish Inn, and Mission Hill Winery’s Terrace Restaurant. 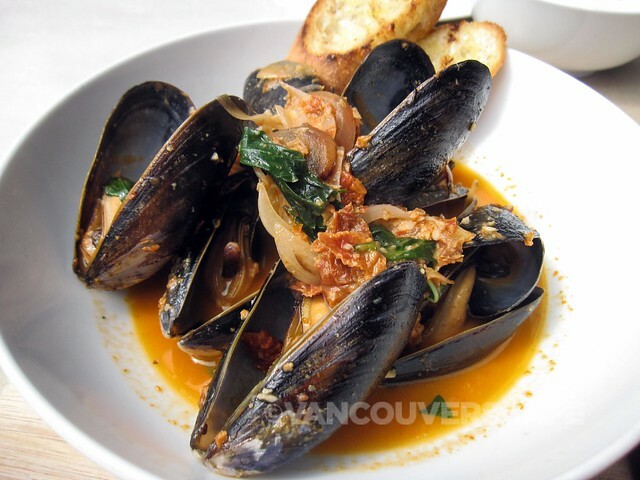 We ordered the Vancouver Island mussels with triple-cooked fries ($15). 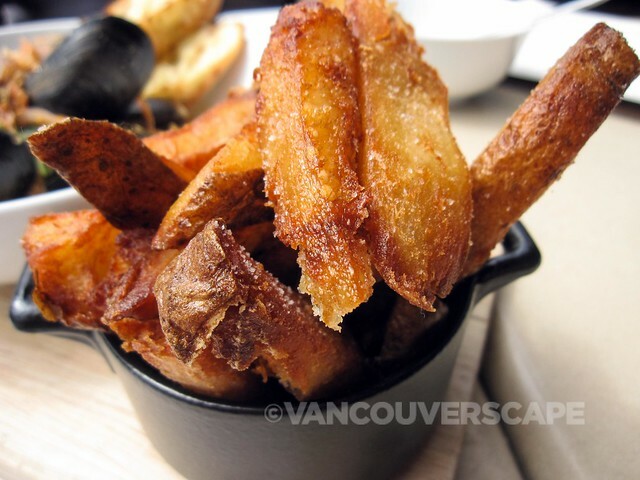 These are not your ordinary fries: they’re soaked to remove starch, then steamed, dried, blanched, and later frozen, brought right to the fryer in order to achieve the crispy outside and soft inside. I recall having devoured these on another visit to the restaurant last year. The locally-foraged mussels ($15) are served in a white wine, shallot, lemon zest and sun dried tomato pesto broth, and toasted baguette for dipping. You’ll want to enjoy this broth. The pesto melts into the wine and lemon, working very well with the mussel’s flavour. The mussels are of good size for this time of year. 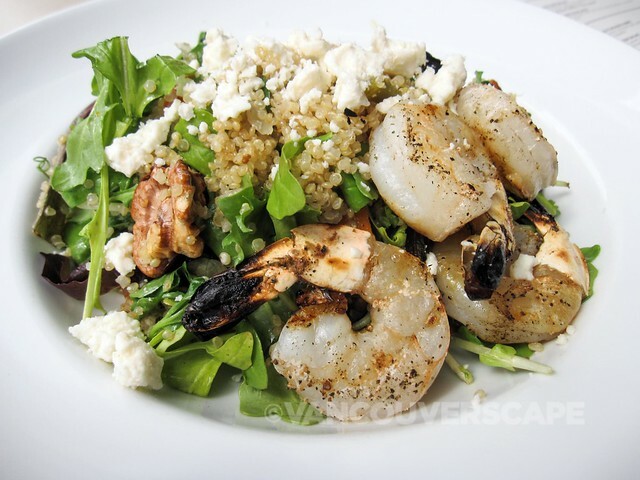 My prawn and quinoa salad ($17) salad was plentiful, the jumbo prawns succulent, both well-grilled and seasoned. Roasted squash adds a sweetness that marries well with the texture and taste of both the mixed greens and the walnuts, all coated with maple vinaigrette and topped with feta cheese. 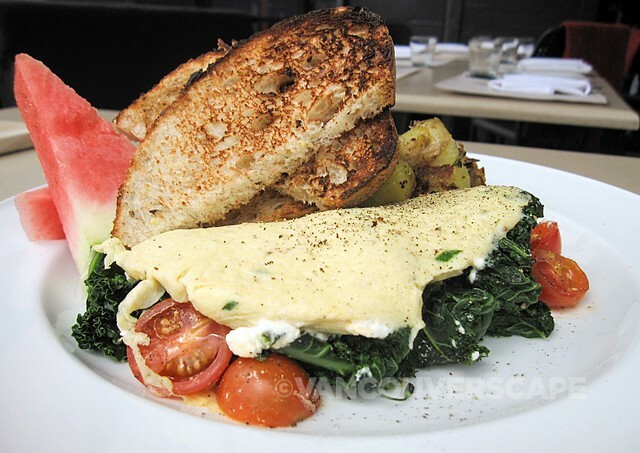 The three-egg kale, tomato, and Okanagan goat cheese omelette ($14) is served light and fluffy enough that I could almost compare it to eating a crêpe. Melted goat cheese, tender kale, and juicy tomatoes all go into a fabulous dish that’s served with toasted multigrain slices. My husband wasn’t overly impressed with the Beef short rib hash ($16) skillet dish. 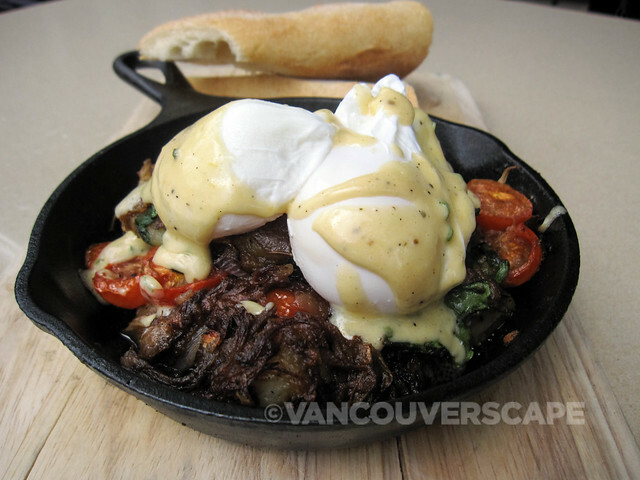 This concoction of shredded short rib, Fingerling potatoes, spinach, poached free-run eggs, and Hollandaise tasted bland and was a bit greasy, compared to all the other dishes that we were wowed with. 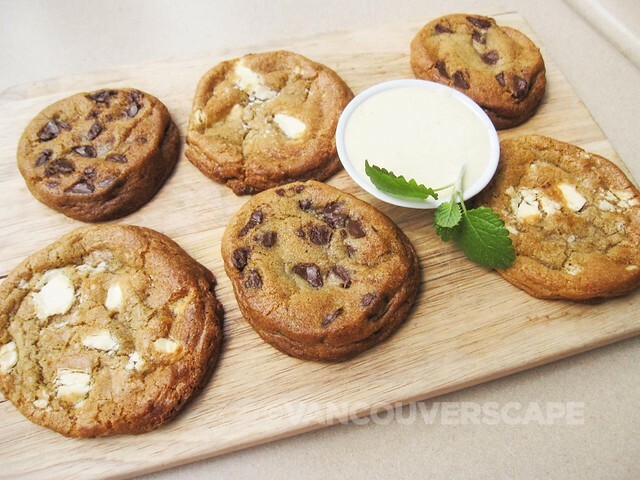 Save room for dessert: West Oak’s signature sweet finish is a plate of home baked, fresh-from-the-oven cookies served with vanilla bean dipping sauce. This too was my second time enjoying the wicked dessert, and I wasn’t disappointed to discover that the quality and taste of the bean sauce and cookies haven’t diminished since my last visit. If cookies aren’t your thing, you can also indulge in pecan pie, a West Oak sundae, chocolate pudding, or warm chocolate brownie (served with vanilla bean gelato and chocolate caramel sauce). Desserts range from $6 to $8. A variety of scotches, cognacs, and ports are also on the menu. 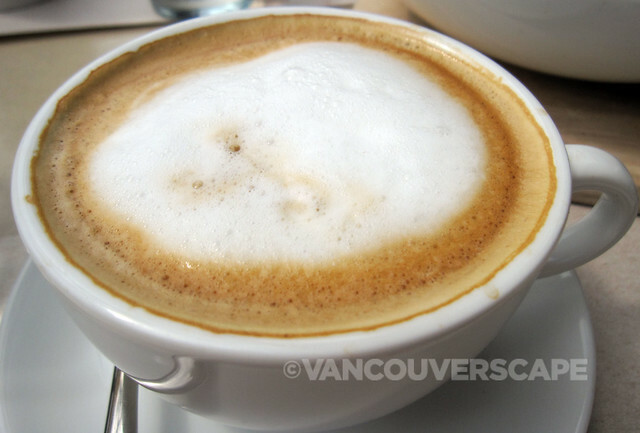 We enjoyed a gorgeous, perfectly brewed Americano misto with our warm cookies. 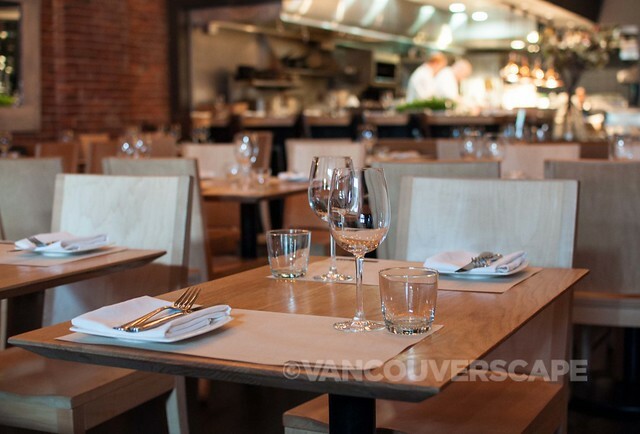 Speaking of saving room, I couldn’t help but notice the West Oak Signature Brunch Platter for four ($80): Free-run scrambled eggs with black truffles, English banger sausage, Fraser Valley bacon, crispy Fingerling potato hash, sautéed mushrooms, grilled tomatoes, and toasted English muffins. Judging from what we’ve enjoyed here so far, you can’t go wrong with a list like that. West Oak is located at 1035 Mainland Street. Brunch is served weekends and on long holidays. 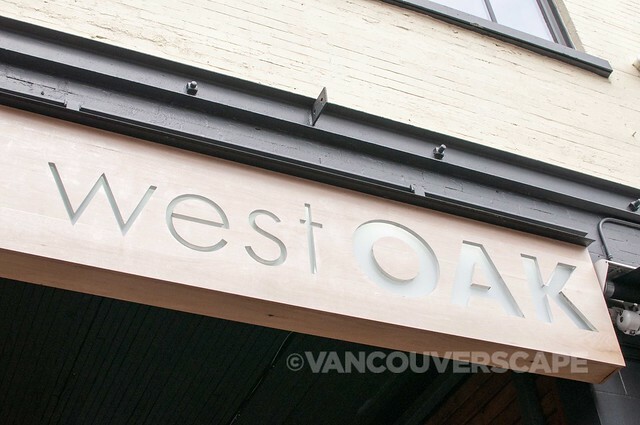 Our brunches were compliments of West Oak for the purpose of trying their brunch menu as well as writing this feature.